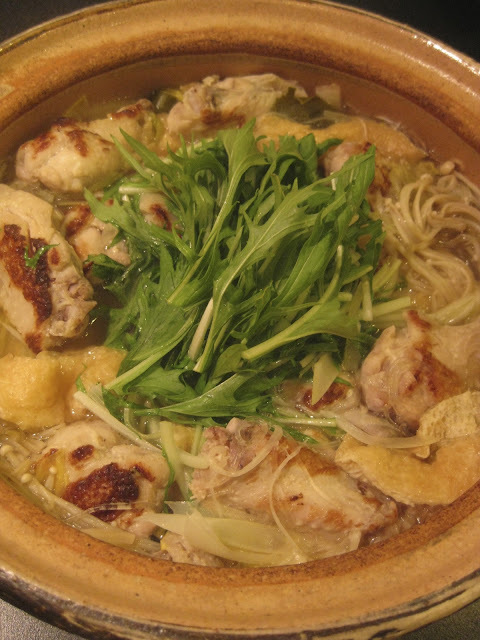 Here's a variation of my last recipe: Chicken Wings and Daikon Hot Pot ("Teba Daikon Nabe"). The main differences are basically Napa cabbage ("hakusai") is used, instead of daikon radish, and Japanese dashi stock is used, instead of chicken stock. That's about it, and it tastes really soothing and nice. 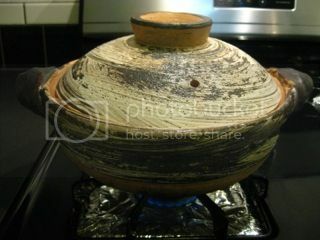 I used classic-style donabe, "Hakeme", to make it. Napa cabbage and fried tofu pouch ("abura age") are piled in donabe, and chicken wings (pan-fried until brown) are added. 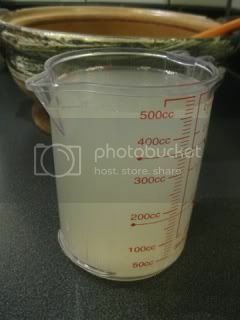 Dashi stock was poured and simmered. 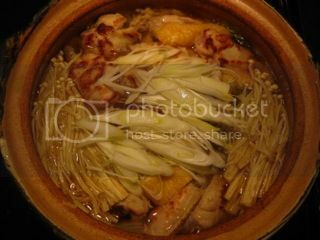 Once everything is nicely cooked, enoki mushrooms and Tokyo negi are added. To finish, mizuna leaves and yuzu rind are added. Rinse the chicken in cold water and pat-dry with paper towel throughly. In a bowl, combine the chicken and shio-koji. Mix well by hand. In a bowl, combine the chicken and shio-koji. Mix well by hand. Cover tightly and refrigerate overnight (or at least 2-3 hours). 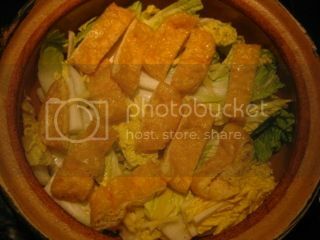 In the donabe, make a pile of Napa cabbage, and add the ginger and fried tofu pouch in layers. Set aside. 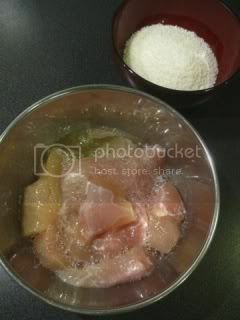 Combine the chicken with the potato starch, and mix well by hand. Heat the olive oil in a sauté pan over medium heat. 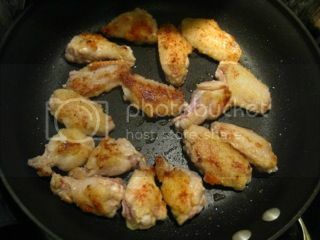 Add the chicken pieces and and cook until the bottom sides are golden (2-3 minutes). Turn them over and cook for another minute or so. Transfer the chicken to the donabe. Add the dashi stock and sake into the donabe, and set over medium-high heat. Bring to a boil and reduce the heat down to simmer. Skim as necessary, meanwhile. Place a drop lid (or line the surface with a piece of parchment paper). Cover with lid and simmer over medium-low heat for 15 minutes. Add the soy sauce, salt, glass noodles, enoki mushrooms, and thinly-sliced white part of Tokyo negi. Cover again and continue to simmer for additional 5 minutes. Add the mizuna and cook for 1 minute. Drizzle the sesame oil and sprinkle sliced yuzu rind. Divide into individual bowls and serve with some sansho pepper powder. Chicken and daikon are a classic combination in Japanese cooking. Until the last minute, I was debating whether I should make a classic stew style dish or a hot pot dish with these main ingredients for tonight. At the end, I decided to do a hot pot. Boy, it came out so rich in flavor and really amazing. 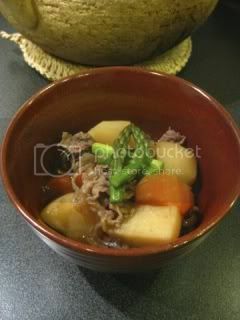 For this dish, I used classic-style doanbe, "Hakeme" (medium-size). 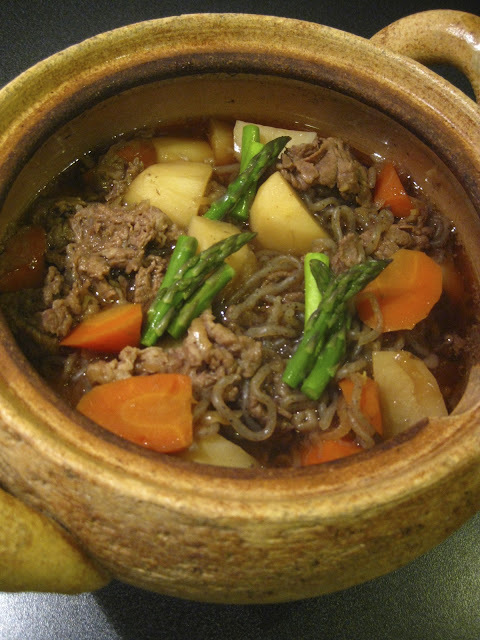 This donabe is just perfect for this recipe. Chicken wings are marinated in shio-koji overnight, and they are pan-fried, followed by the daikon radish. 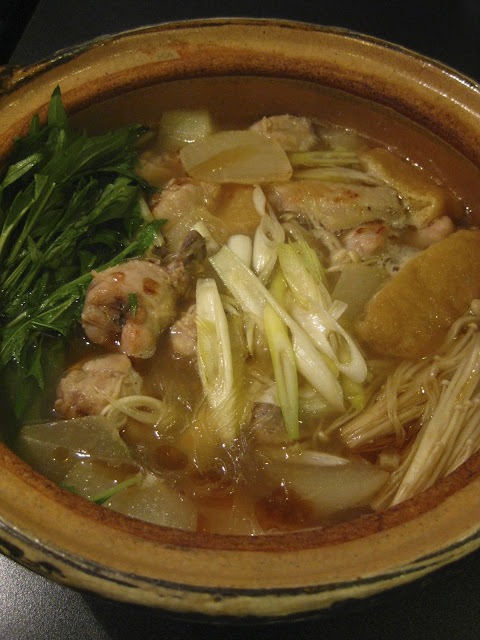 Ingredients are assembled in donabe and simmered until ready. The broth becomes so rich. The chicken wings are fork tender and fall apart in the mouth. Daikon absorbs all the deep flavors. Rinse the chicken in cold water and pat-dry with paper towel throughly. In a bowl, combine the chicken and shio-koji. Mix well by hand. Cover tightly and refrigerate overnight (or at least 2-3 hours). In a separate bowl, combine the dashi kombu with the chicken stock. Set aside for 30 minutes to a few hours. 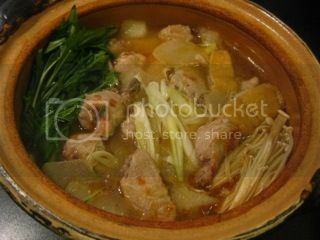 Put the ginger, Tokyo negi (green part only), and abura-age in the donabe. 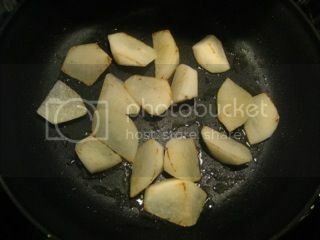 In the same sauté pan, add the daikon and cook until both sides are lightly golden (about 2 minutes per side). Turn off the heat. Transfer the daikon to the donabe. Add the chicken stock (with the dashi kombu), and sake into the donabe. Set over medium heat. 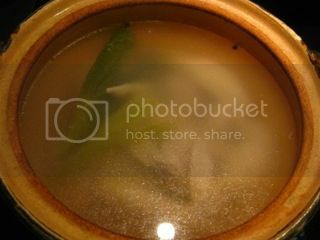 Remove the dashi kombu when the broth is almost simmering. Skim as necessary. Drizzle the sesame oil and sprinkle some ground black pepper. Divide into individual bowls and serve with some yuzu kosho paste on the side. 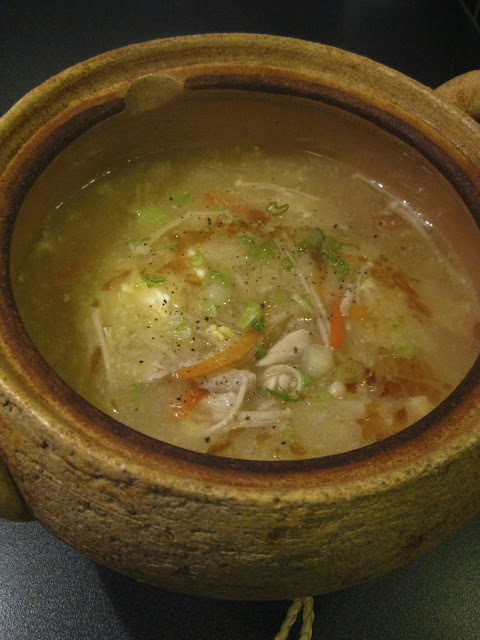 Here's a quick and tasty recipe by using the Japanese chicken stock. I call it "healing" soup, because it's a very soothing chicken soup with egg and vegetables, with the addition of Japanese black vinegar. Vinegar is said to help removing fatigue from your body. I feel very relaxed after drinking this soup. Japanese black vinegar has rich umami flavor and natural sweetness, so I like to add a generous amount of it to this recipe. But, if you want the vinegar flavor to be more subtle, you can reduce the amount of vinegar. With the remarkable heat retention ability of my soup & stew donabe, "Miso-shiru Nabe", this soup stays very even 30 minutes after turning off the heat. Once the vegetables are cooked and the broth is seasoned, just add the egg and gently stir. To finish, a little drizzle of sesame oil will make it further aromatic. 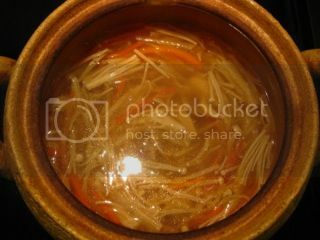 In "Miso-shiru Nabe", combine the chicken stock, sake, ginger, daikon, and carrot. Set over medium-high heat. 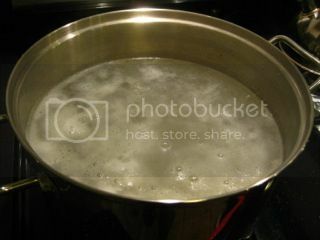 As soon as the broth starts boiling, reduce the heat to simmer. Simmer for 5 minutes. Add the enoki mushrooms, glass noodles, and chicken. Continue to simmer for 5 minutes. Add the vinegar and soy sauce. Adjust the seasoning with salt. 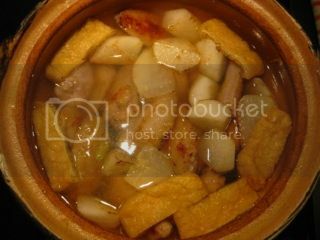 In a small cup, dissolve the potato starch in the water, and drizzle into "Miso-shiru Nabe". Stir. Drizzle in the egg and gently stir, so that the egg won't make the broth cloudy. To finish, drizzle the sesame oil and garnish with the scallion slices. This is my regular multi-purpose donabe chicken stock. It's so simple, fast, and delicious. Chicken wings, with their bony and collagen-rich structure, gives very nice flavors to the broth in a short time. 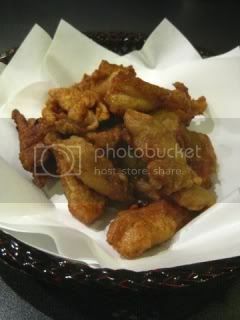 The bonus is that because the chicken wings are cooked for short enough time, you can also serve them in a dish. They become very tender and flavorful. I always use classic-style donabe to make my stock, because the gentle heat distribution of donabe makes a very elegant and rich broth. With its remarkable heat-retention ability, its extra-slow cooling process helps further deepening the flavor, too. Ingredients are put together and simmered for 20 minutes. After 20 minutes resting, pure and rich chicken stock is ready. It's perfectly white. Cooked chicken are so tasty, too. 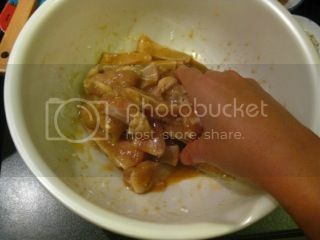 In a bowl, combine the chicken wings and shio-koji (or salt) and mix well by hand. Cover and let the chicken marinade 2-3 hours to overnight. *If you want to serve the chicken afterwards, this process will help making the chicken tastier. Or, you can completely omit this process and start with unseasoned chicken. 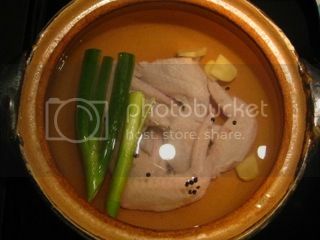 Rinse the chicken in cold water throughly, and combine with the rest of the ingredients in donabe. Cover with lid and set over medium-high heat. As soon as the broth starts boiling, turn down the heat to simmer. Skim as necessary. 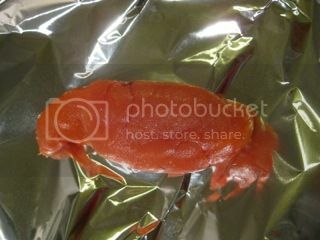 Cover the surface with a drop lid ("otoshibuta") or line with a piece of parchment paper. Cover with lid again and simmer for 20 minutes. Turn off the heat and let it rest for 20-30 minutes. 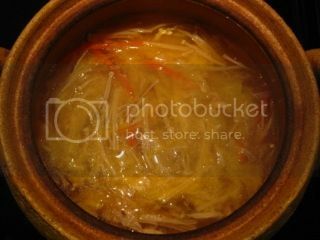 *The resting time will help further deepen the flavor of the stock. 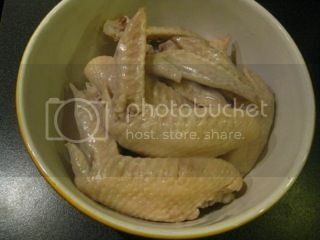 Transfer the chicken wings to a bowl and save for another use. Strain the stock. Tip: If you want to make extra-rich collagen-packed chicken stock, continue to simmer for 4 hours. Replenish with more water as necessary to avoid the stock is reduced too low. 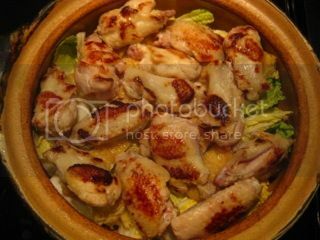 Chicken wings used for the extra-rich stock should be discarded, as they become quite exhausted after simmering for a long time. Super Izakaya Night...Fried Chicken Cartilage ("Nankotsu Karaage"), Handmade "Ju-wari" Soba, etc. A friend of mine, who is a soba maker, just returned from Tokyo and came to our place for dinner. She showed up with a lot of gourmet foods from Japan, as well as her freshly-made "Ju-wari" soba noodles, made from freshly ground soba flour from Japan. 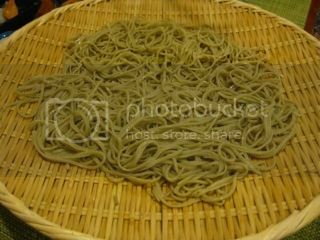 "Ju-wari" means 100%, so this style of soba is made from 100% buckwheat. So we did a fun izakaya night. Yes, I made more "karaage"...and this time, I found Chicken "nankotsu" (cartilage between breast meats) cuts at a Japanese market. So, I was really excited and made a Chinese-style fried chicken. For the batter, I also used Chinese five spice and whole egg. Once they were fried, I served them simply with lemon wedges. 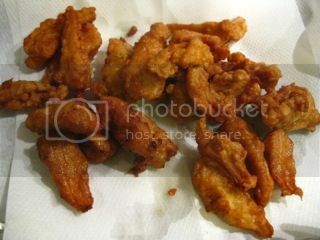 They came out really good, with the thin crispy breading and nice crunchy texture. I love chicken "nankotsu" so much! 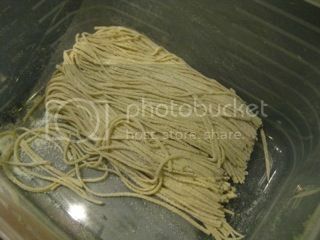 I also fried her leftover end cut soba noodles. They make such a nice snack. 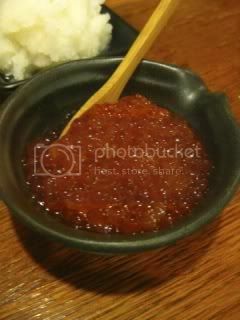 We also had some special ikura (salmon roe) from Hokkaido, fava bean miso, natto kombu, etc. 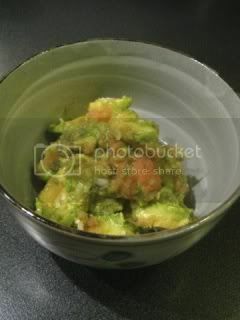 With a big tarako (salted cod roe) from Hokkaido, I quickly fixed a dish with avocado, Tokyo negi, and irizake. It was so nice with Junmai Ginjo "Tamajiman" from Oume, Tokyo, which she also brought back from Japan. 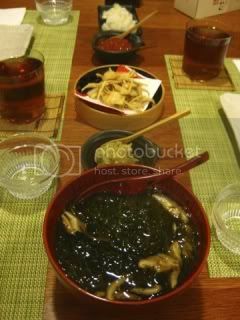 Then, we had the special soba time. 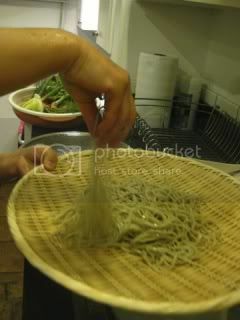 Her handmade "Ju-wari" soba was superb! 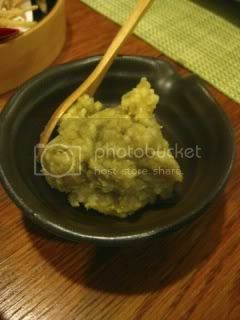 We enjoyed with dipping sauce and some ground walnuts from Niigata, Japan. 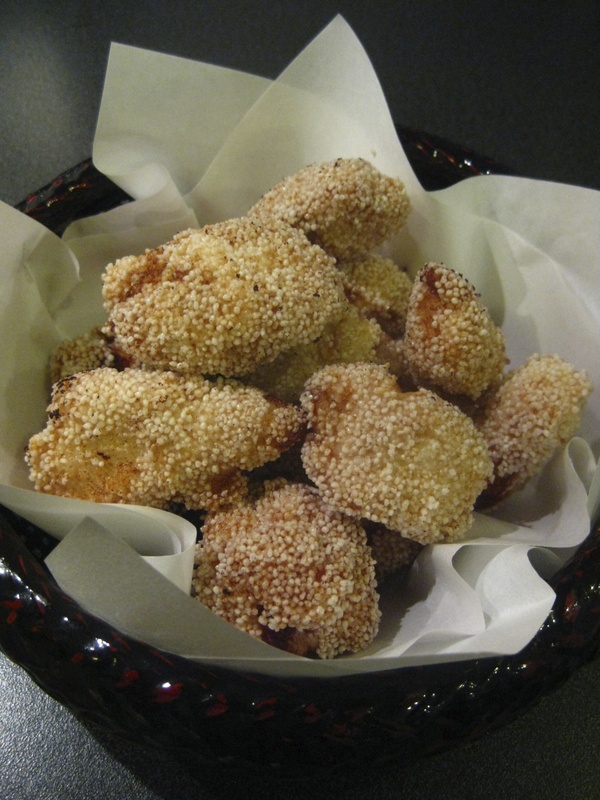 I've been making a lot of kara-age and tempura lately. This is one of our party favorites. 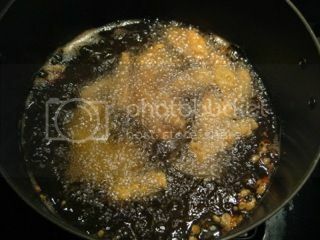 I make lightly-seasoned classic Japanese-style fried chicken ("Kara-age") and pour tangy and aromatic black vinegar sauce. It's really good. 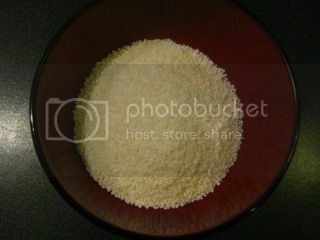 In a bowl, combine the chicken, sake, soy sauce, and grated ginger, and mix well by hand. Cover and refrigerate for 2-3 hours (or 30 minutes is good, if you don't have enough time). Meanwhile, in a bowl, whisk together the ingredients for the sauce. Set aside. Dredge the chicken in potato starch and deep-fry in the 360F (180C) degrees oil for 4-5 minutes or until the chicken is cooked through and the outside is crisp. Depending on the size of the fryer, cook in separate batches. 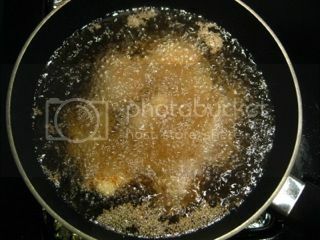 Transfer the fried chicken into a serving bowl and pour the sauce over. Serve immediately. The chicken is just so good. I love to taste them with freshly made donabe plain rice. I also like the next day leftover when the breading of the chicken becomes soft. 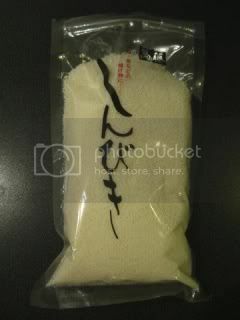 Shinbikiko is a special type of rice flour, made from sweet rice. The process of making Shinbikiko is quite remarkable. 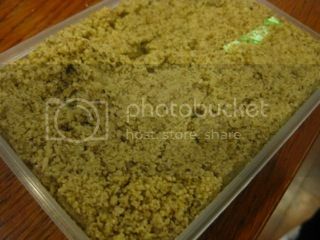 Sweet rice (mochi rice) was steamed, dried, and ground to be "Domyojiko", which is shiny coarse ground rice flour, typically used for making Japanese confectionary. This Domyojiko is further ground to finer powder, then carefully toasted to make it puffy (but with no color!). 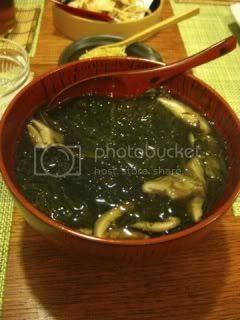 Shinbikiko is used for both Japanese confectionary and savory dishes. 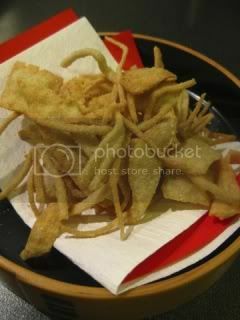 Most common way of using Shinbikiko in savory dishes is for batter for frying. Especially with delicate fish, Shinbikiko makes beautiful airy crust. 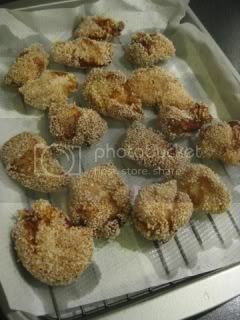 With Shinbikiko, I made simple Kara-age chicken (fried chicken). The recipe is extremely simple. 1. Cut 10 oz (300 g) chicken tender into bite-size pieces. Marinade in 1 tablespoon shio-koji overnight (or 2-3 hours is fine). 2. Combine the chicken (with the marinade) and egg white from 1 egg and mix well by hand. Set Shinbikiko in a bowl on the side. 3. Heat vegetable oil to 360F (180C) degrees. Lightly dredge each piece of chicken tender in Shinbikiko and deep fry in the oil until outside is crispy and inside is cooked through (about 3 minutes). 4. Serve with lemon wedges. Crust was so airy and chicken was so tender and juicy. Shinbikiko totally upgrade your homey kara-age to another level. How lovely. 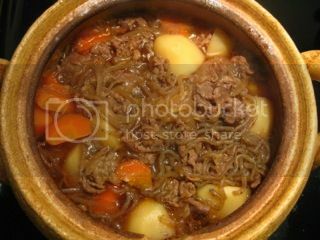 "Nikujaga", which translates into "meat and potato", is a traditional Japanese comfort food. 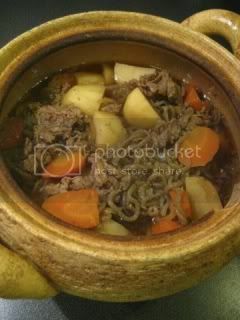 It's classically made with thinly-sliced beef, cut potatoes, and vegetables, and made into soy-flavored stew. 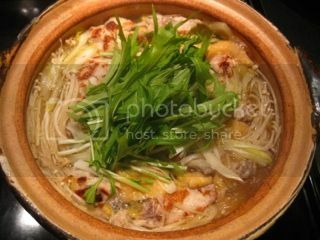 With my soup & stew donabe, "Miso-shiru Nabe", my rustic and very homey Nikujaga always becomes deeply flavored and very nice. 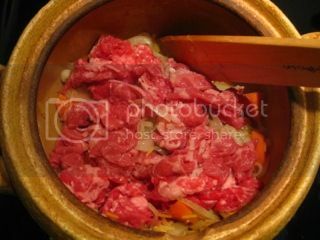 Meat and vegetables are simmered together. So rich and comforting flavor. 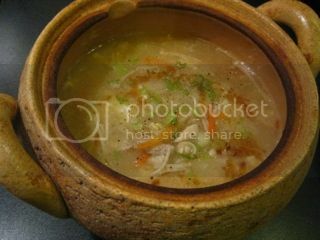 I love my donabe Nikujaga". Heat the sesame oil in "Miso-shiru Nabe" over medium-heat. Saute the ginger and onion until the onion is very soft (7-8 minutes). Add the beef and stir until it's mostly cooked. Add the carrot, potatoes, and konnyaku noodles. Stir again. Turn the heat to medium-high. 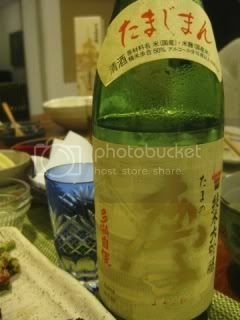 Add the sake and enough dashi stock to almost cover the ingredients. 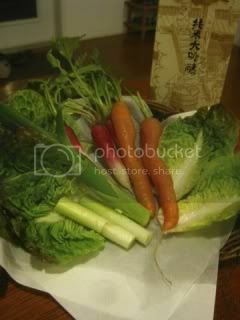 Line the surface with a drop lid ("otoshi buta") or a parchment paper. Cover with lid and simmer for 10 minutes. Add both kinds of soy sauce and continue to simmer for 15 minutes or until the potatoes are tender when tested with a toothpick. *If you have time, let it rest for a few hours (or at least 30 minutes) and just reheat when ready to serve. With the additional resting time, the flavors will be even more integrated and better. Happy Donabe Dinner in Sonoma...We did it again!